For you and your dog(s) to perform at the top of your game, you both need to be in sync with each other. You need to communicate with each other effectively so you can anticipate each other’s movements, and your dog can understand your commands. Performance dogs are a special breed of animal. They are athletes who suffer from aches and pains, confusion, and sometimes have off days just like anyone. But if you and your show dog are having more than the normal occasional off day, then talking with them can make all the difference in the world — in their health, their well-being, and their show scores. Your dog also needs to have trust in you that you understand him, have his best interest at heart, aren’t working him in a way that is uncomfortable, and that he is being asked to do something that he is skilled in and likes to do. Many dog owners and trainers try to force their dogs to be and do things that aren’t a good fit. Wouldn’t it be better to find this out before you put yourself and your dog through the rigorous training necessary for these higher level competitions? If you are having issues with your dog, he may be trying to tell you something. Dogs communicate with humans in a way that makes sense to them. Therefore, it is best if you can find out what the real issue is with your dog before you cause harm by not understanding the real cause of the issue. To enhance your show dog’s performance you first must get an evaluation from a qualified professional who is skilled in determining what is needed. Val has been working with show dogs since 1993 to improve their performance by first doing an evaluation of a dog. She speaks directly with the dog and the trainer/owner to determine what can be done to improve show performance. Sometimes seeing things from the dog’s perspective is the one thing that turns things around. Dogs do what makes the most sense to them. By bridging the communication gap between the dog and thetrainer/owner the issues that are preventing the dog from improving their performance may now be addressed. To schedule an appointment with Val do discuss how to improve your dog’s behavior problems or poor performance issues,click here. Do you want to learn how to talk to your dog? The World’s 1st Complete How To Talk To Animals, The Complete System: Beginning Core Foundation Home Study Course – for dog lovers! This unique life changing course helps you learn how to talk to your dog! Change bad behavior and resolve problems, learn if your dog is happy or sick or in pain, listen to the wisdom and discover your dog’s viewpoint. 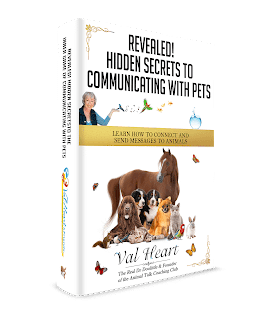 16 cds and Study Guide Workbook of over 160 pages gets you started in no time — with special bonuses including Val’s Introducing Animal Communication Home Study Course.